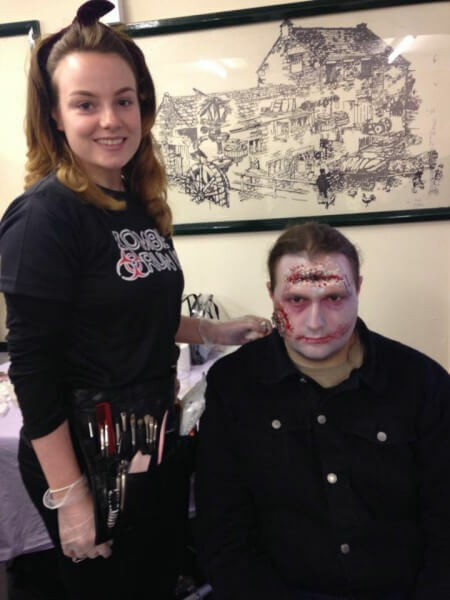 Six Barnsley College Media Make-up students were part of a team of make-up artists creating hundreds of ‘undead’ for the annual Zombie Run at Worsbrough Mill and Country Park recently. Students Jessica Baker, Agata Peters, Leah Richardson, Amber Roberts, Jodie Simpson and Cherece Spencer prepared the volunteer zombies prior to the 5k race, which took runners through woodland, marshland, fields and man-made obstacles. The runners were raising funds for Barnsley Hospital Charity and the aim of the run was to reach the finish line without being caught by the zombies. The students were invited to help with the preparation of the living dead to give the event a much more authentic feel using lots of blood and prosthetic skin. For more information on Hair and Beauty courses at Barnsley College including Media Make-up, call 01226 216 123, email info@barnsley.ac.uk or attend the Open Evening on Wednesday 26 November, 6.00pm to 8.00pm, at the College’s main Old Mill Lane campus on Church Street.